The Philosophy of a Sentence and its Parts, is a research work of immense value on a semantic theme designed to serve as a compendium of all matters regarding the meaning of a sentence, its parts and their syntactical connection. 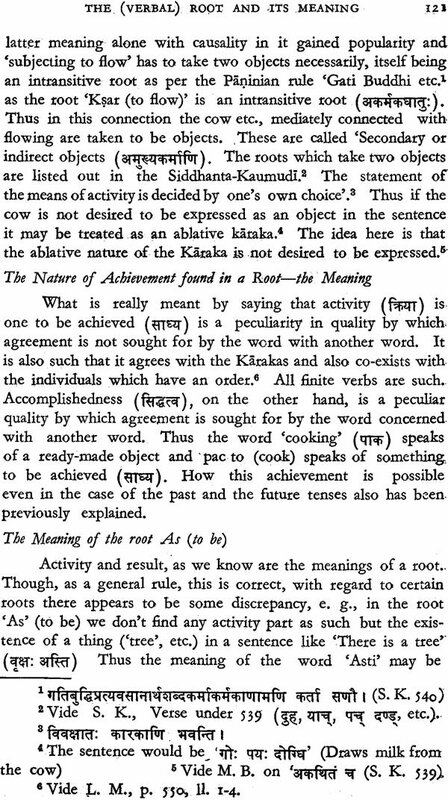 The importance of the study of a sentence and its meaning in the domain of knowledge need not be over-emphasized. 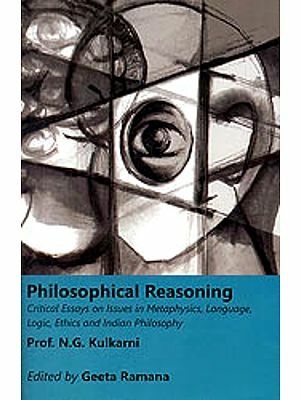 For the first time in research, material has been collected from first hand authentic Sanskrit sources of the schools of thought of the Grammarian (Vaiyakarana), the Logician (Tarkika) and the exegetist (Mimamsaka) and arranged and criticized by the author in detail with important polemical issues raised. 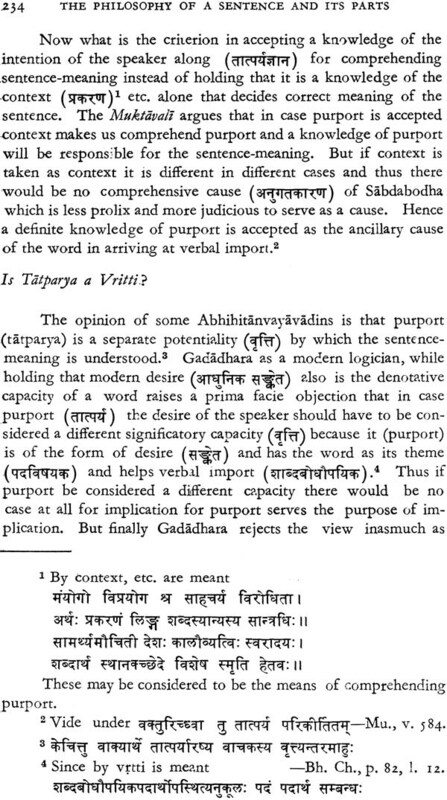 In book I, of this work, the controversy on verbal import (Sabdabodha) among these schools has been set forth in great detail (with diagrammatical sketches) and the author has attempted a novel solution for this basing his findings on the actual nature of the controversy. 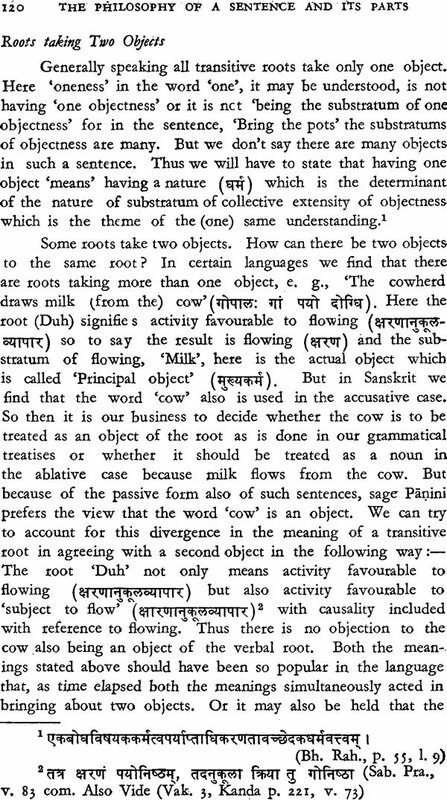 Incidentally the Vakyavadin-Padavadin controversy, the reality or otherwise of words, the Sphota theory, the Anvitabhidhana and Abhihitanvaya points of view as also the theories of sentence-meaning-Intuition (Pratibha), Syntax (Samsarga) and the syntactically connected (Samsrsta)-all these have been dealt with along with a critical estimate of their defects and merits. Not only the meaning of a sentence in general but the (import of different typical sentences has been explained in relevant places according to the different schools. In Book II, of this work, the meaning of the parts of a sentence viz. 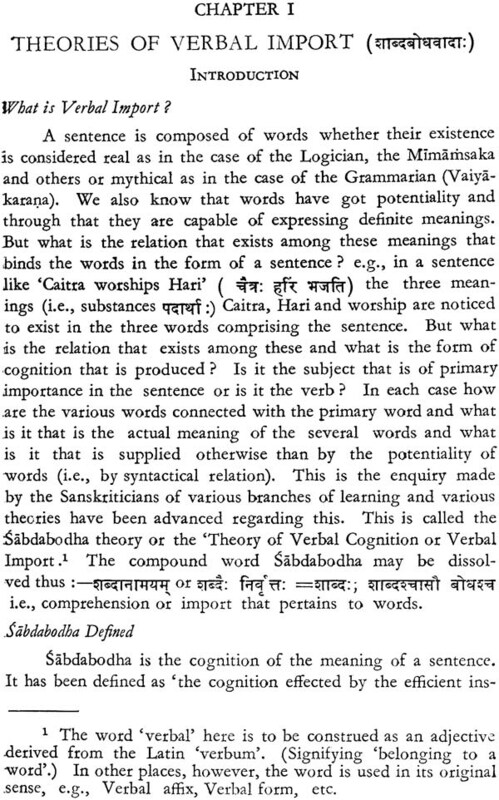 the verbal root (Dhatvartha), the verbal affix (lakarartha), the nominal stem (Pratipadikartha) and the case affix (Subartha) have been discussed with their disputational details according to the three schools of thought. 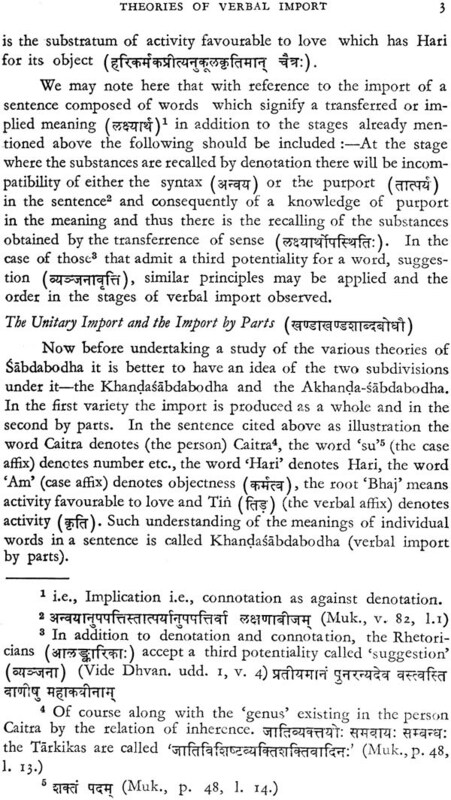 The meaning of complex formations (Vrttivicara), the expressional potentiality of the Sanskrit language, its limitations and the order of words in a Sanskrit sentence have been tried. To facilitate a clear understanding of and an easy reference to the work, a glossary of technical terms and a concordance have been given as an appendage. Dr. Veluri Subba Rao, born in 1918 at Bhimavaram in Andhra Pradesh is at present Professor of Sanskrit in the Andhra University, Waltair. Since his child-hood he has been an ardent student of Sanskrit and has distinguished him self as a Scholar in Sanskrit taking his M.A. and Ph.D. Degrees from the Nagpur University. He is the first of the Sanskritists to attempt a thorough study of the meaning of a sentence and has rendered immense service not only to Sanskrit but in a sense to the gamut of Languages. His studies embrace various fields of Knowledge - Poetry, Logic, Grammar and Philosophy - especially Epistemology. The Indian Theories of Knowledge is his another book awaiting publication. 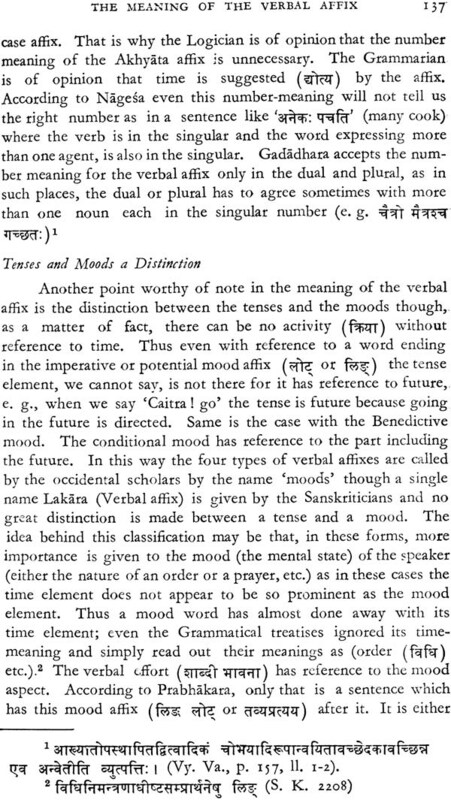 The science of Grammar in Sanskrit language has been studied in a unique manner-which is quite .different from the same in other languages. Usually the science of Grammar is regarded as concerned with teaching the correct forms (Sabdanusasana). But the Sanskrit Grammar goes further. It dives into the derivation of words (Nirvacana). It also concerns itself with the step-by-step formation of the finished forms (Subanta and Tinanta). And then it extends its scope to the cosideration of the relation of a word with its meaning and the relation between words in a sentence and so on. 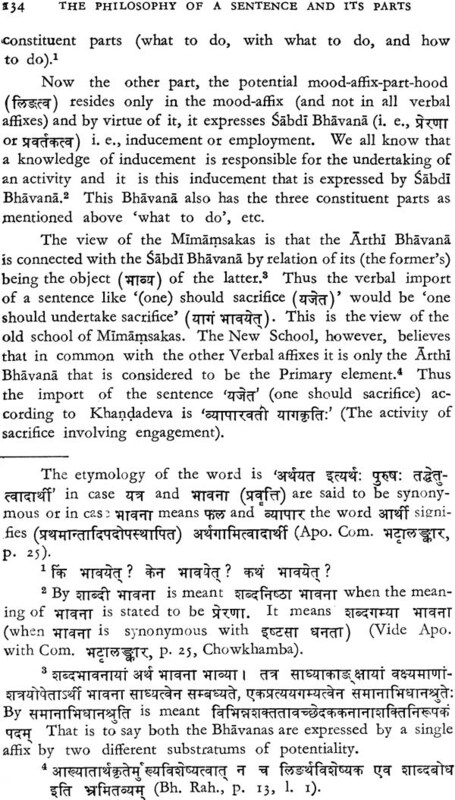 The last aspect of grammatical studies (Arthavicara) has been a ssiduously pursued and treated threadbare by Indian Pandits from an early period. Patanjali begins his famous work Maha- bhasya with the' question as to what is word, what is its relation with the object denoted by it, wherein lies the power of expression, whether letters, syllables, words, phrases or sentences have inherent expressiveness in them. The analysed as well as complete aspects of language are closely studied. 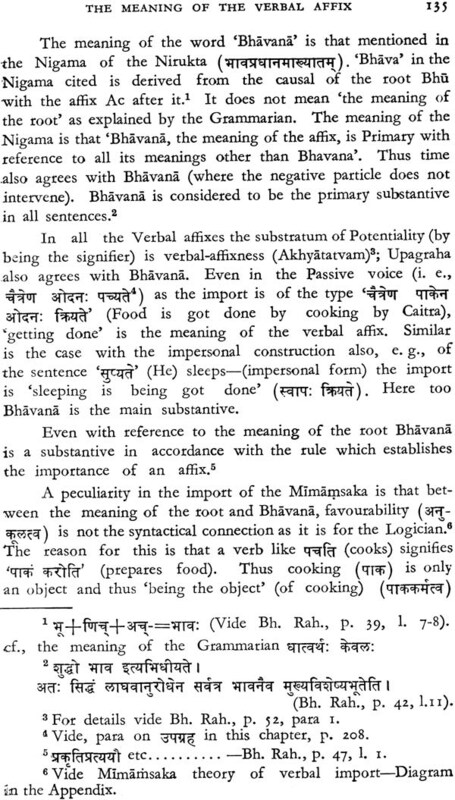 The unique concept of Vakya- Sphota is an unparalleled contribution of Indian mind and on psychological considerations the doctrine of Sphota, like Apurva of the Mimamsakas, is established as a link between what is heard and what is comprehended. Its identification with Sahda- Brahma has raised these speculations to the higher spheres, where- in Grammar and Philosophy meet and Grammar (Vyakarana) has been proclaimed as a Darsana and given a definite place in the Sarva-Darsana-Sangraha. 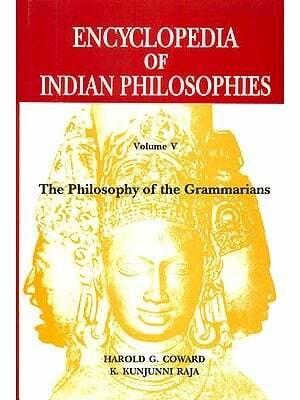 Bhartrhari, Kaundabhatta and Nagesabhatta have written pioneer works on this speculative branch of Sanskrit Grammar. The science of Grammar in their hands is no longer only a Sahdasastra; in collaboration with Naiyayikas and Mimamsakas it becomes Arthasastra or more explicitly Sahdarthasastra. The learned treatment of this special grammatical study, being highly technical and intricate, is regarded as an intellectual feat, beyond the comprehension of an ordinary Sanskritist. There was there- fore a real need for a work which could present these intricate speculations in a lucid and simple garb for the indologists of the English-knowing world. That need has been fulfilled by the pre- sent work by Dr. V. Subba Rao of Andhra University. He is an astute student of Sanskrit Grammar. - For more than two deca- des he has studied laboriously its .Artha- Vicara aspect as discussed in the Vakyapadiya, Vaiyakarana-Bhusanasara and Laghu-Manjusa, etc. Through this commendable work the windows have been opened and the precious unapproachable wealth of Indian Grammarian's genius has now been made available to those who desire to appre- ciate its splendour. As one who has been associated with its inception and re- cognition by the Nagpur University, it is but natural that I should feel great pleasure in writing this Foreword to the nicely- planned and executed book and placing it before the serious students of Sanskrit Grammar. The present work is substantially the same as the one that has been designed to serve as a dissertation for the Doctor of Philosophy (Ph. D.) Degree of the Nagpur University in 19n• This thesis entitled "The Philosophy of a Sentence and its Parts" is the result of a protracted study of and a continuous deliberation over the Science of Words and Sentences'. for several years in the orthodox oriental fashion. A couple of years of research made under the auspices of the Nagpur University and the able guidance of my supervisor, Professor S. P. Chaturvedi, formerly Principal, Nagpur Mahavidyalaya, Nagpur, and at present Professor in Sanskrit, Allahabad University, has immensely contri- buted to complement my effort at trying to systematise this extremely difficult Semasiological (Arthika) theme of a highly polemical nature which has been for ages a common field of study not only for the theistic Schools of Grammarians, Logicians and Mimamsakas but for almost all others-Ontologists, Meta- physicians and Philosophers of even atheistic leanings. All .knowledge from time immemorial has been handed down to us only in the form of sentences and all the knowledge too which we possess, knows but one single form-that of a sentence. It cannot be argued under limits of human experience that there is the comprehension of an idea which does not assume the form of a sentence either in its active or inactive state. That is the very reason why a study of the sentence has been deemed obligatory for anyone attempting a critical investigation and a precise presentation of scientific thought. 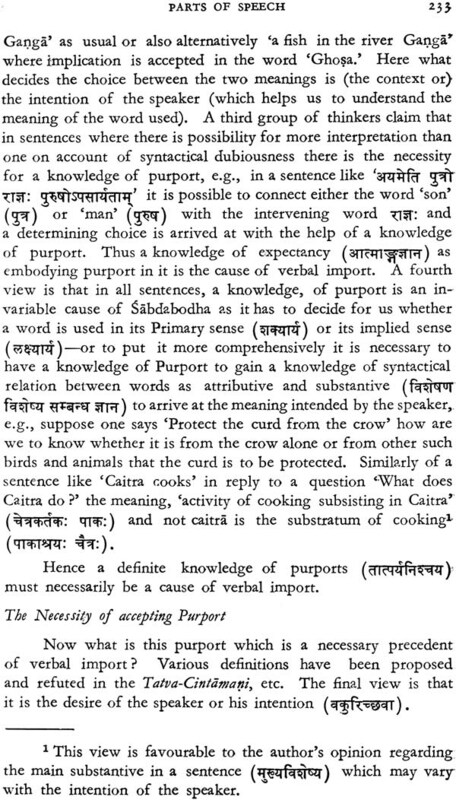 In Sanskrit Grammar we have a large number of works dealing with the formative aspect of words but works on the semantic side are few and far between. A few works like the Vakyapadiya and the Laghu-Manjusa, have completely devoted their attention to this subject. The Logicians and the Mimam- sakas have discussed .this topic at length in the Verbal Testi- mony" part and have written separate treatises like the. Vyutpattivada, the Saktivada, the bhatta Rahasya and the Bhatta. Chintamani, all of which are carefully studied and from which I have quoted freely in the footnotes with the necessary reference numbers. .Nobody who professes to be a Philosopher or a scientist could ever ignore this study. This extremely critical and highly technical study of the sentence has been neglected even by most of the Modern Research Scholars excepting a few. Dr. Chakravarti's two books on the subject 'Linguistic Speculations of the Hindus' and 'The Philosophy of Sanskrit Grammar' have very well aimed at popularising this theme but the study therein was primarily concentrated on the Grammarian's school of thought. 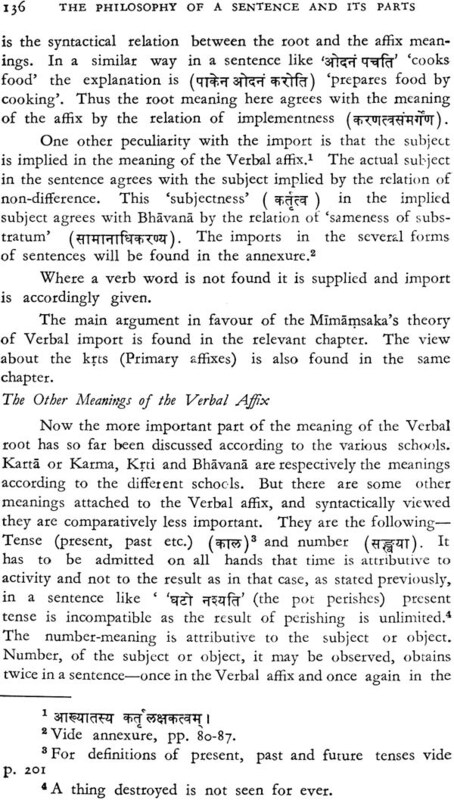 The present attempt, therefore, in this work has been to give de novo a complete picture of the sentence and its various parts according to the three important schools of philosophy already mentioned-the Grammarian's, the Logician's and the Mimamsaka's, Both the Prabhakara and the Bhatta Schools of Mimamsa have been discussed in the present ,work. 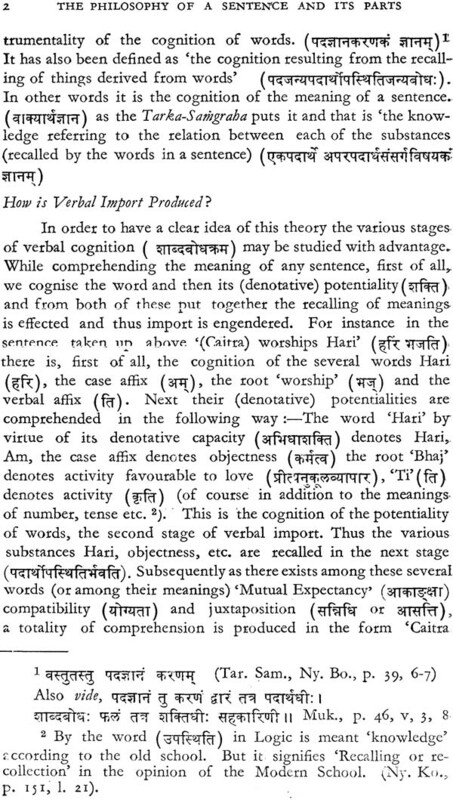 Some topics like the theories of 'Verbal Import' (the import of a sentence), the Sphota-vada, the Vakyavadin-Padavadin con- troversy, the definition of sentence, etc. are some of the very new features of this work. I have also tried to enter into their not- too-subtle controversial details keeping an eye on the. popular reader with an average scientific bent of mind. 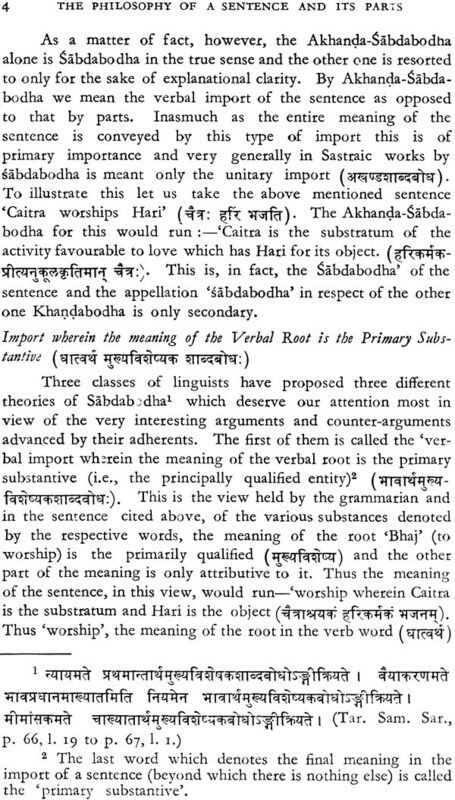 Sanskrit equiva- lents for words and sentences cited as illustrations are given side by side with the English version for the sake of clarity in technical detail. 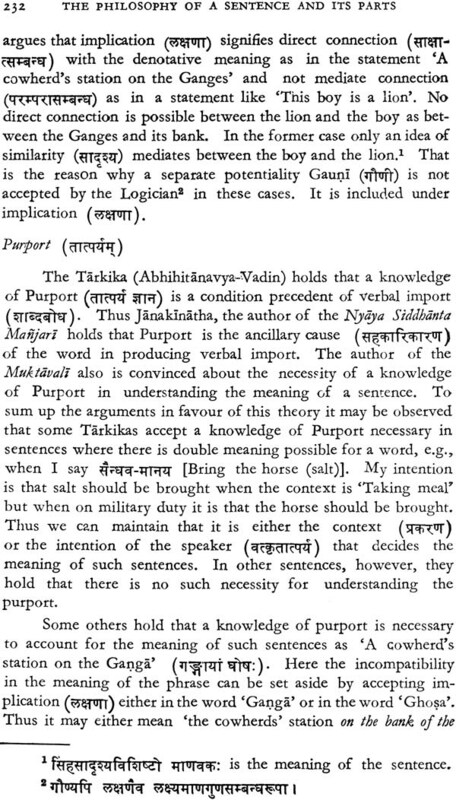 Interesting polemics on the 'Theory of the Import of a sentence' 'the Anvitabhidhanavada, the Abhi- hitanvayavada, the meanings of case-affixes, etc. have been brought in here. The great books and the commentaries upon them on this dffficult subject are not within easy reach of the readers-Ignotum Per Ignotius. For a felicitous understanding of difficult things tabular forms and genealogical tables have been given. Illustrations of all things of a highly disputational character have been' under- taken. References to epistemological details' too could not be overlooked while treating a• subject like this. It has been, right through, my humble effort to discuss each of these topics originally while criticising the views of the ancient scholars-for the first time collected, criticised and epitomised, this work being intended to serve as a compendium on all matters concerning a sentence and its parts. But my head hangs low while trying to tread these labyrinthine tracks of hidden know- ledge already traversed with confidence by those great men of old, of mental, moral and spiritual equipment generally unknown in the present day. This universe, I believe, is not the same for all human beings for, despite the objective reality or otherwise of the external things, it is this mental, moral and spiritual altitude of a man that decides what part of this vast universe is intended for his survey. The rest of the cosmos is a sealed book for him. Making tills frank statement about knowledge I lend myself to be corrected in any detail in which I might either consciously or unconsciously have gone wrong. Just a short but relevant digression. The study of a sentence is almost a battlefield for the philosophers where dialectical bombardments of several types are undertaken in great measure and great technical heroism is zealously displayed by each school of philosophy. This subject is a meeting ground for various schools because, for the Grammarian who discusses the nature of words for the Logician who deals with the nature of the means of knowledge and the Mimamsaka who con- templates on the meaning of a sentence a sentence is the means of expression and on a precise and concise use of words in a sentence and its meaning depends the whole frame- work of understanding. 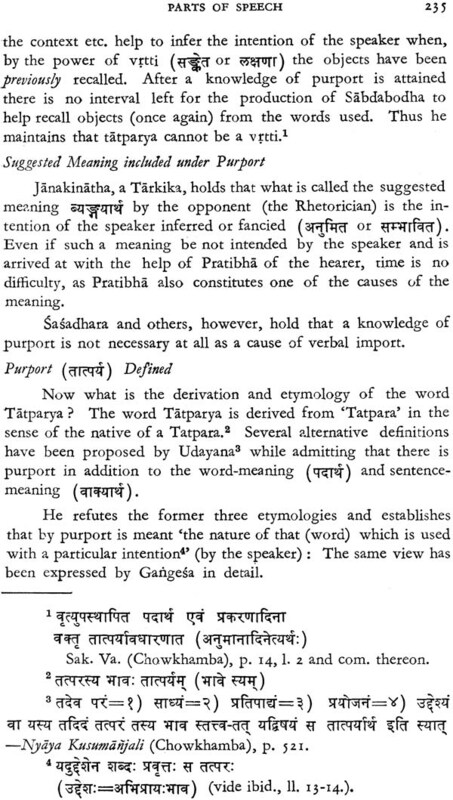 The Tarkika (Logician), even from the beginnings of the time of the twin sciences of Nyaya and Vaiseika believed in exactitude of statement including concision and precision and detested any type of redundancy, cumbersomeness or vagueness of meaning in any measure. That is how in course of time the necessity for an exact expression of ideas was keenly felt especially in discussing subjects of a very subtle nature like God, Godhead, absolution and so on and so forth, most of which depended on Inference or Verbal Testimony. That is the reason why the Naudea school of Logicians nourished this new and combined school of thought popularly called Tarka (Logic). The credit of the in- ception of this binary philosophy goes to one, Gangesopadhyaya by name. whose work "Tatva-Chintamani' startled the intellectual luminaries all over the country. 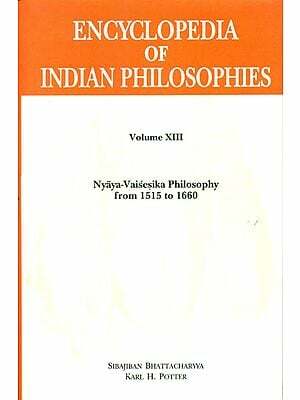 This single work' of the monarch of Indian intellectuals, though as small in size as any elementary text book in History or Geography of to-day, invited a commentary of ten lakhs of pages even during centuries when books were written in manuscript.